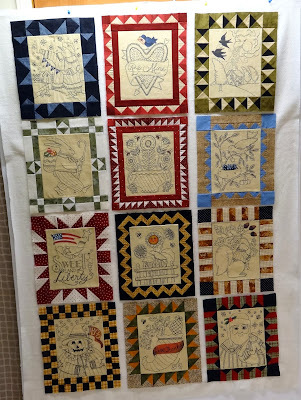 Squash House Quilts: The Final Block! Hooray...I finished my final Kathy Schmitz Sweet Stitches Block of the Month! Here is the January block. This snowman is really dressed for the cold! I think he must live in our neck of the woods. We've had tons of freezing fog, which when it's happening falls just like snow. It even accumulates! I placed all the blocks on my design wall. Did you notice I even fixed my November block after an attack of "senior dyslexia"? You can see how it used to look HERE. I knew I wouldn't be able to live with myself if I didn't make it right. I was going to make 9-patches as corner stones between the blocks, but once I put them up on the design wall it became apparent that it's already busy enough as it is! I'll sash the blocks with something neutral instead. When I get some samples together I just might ask for your opinion. If anyone has an opinion now, feel free to weigh in! The blocks look fabulous. I love the way January snowman is dressed. Your stitching is beautiful. I heart snow folks. Your work is so precise. 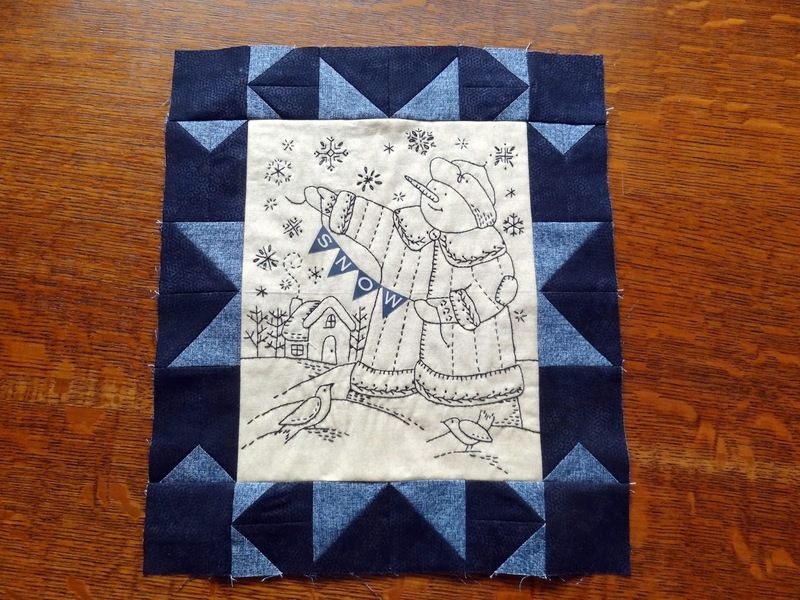 However you finish your blocks, I'm sure will be warm, cozy, and beautiful. 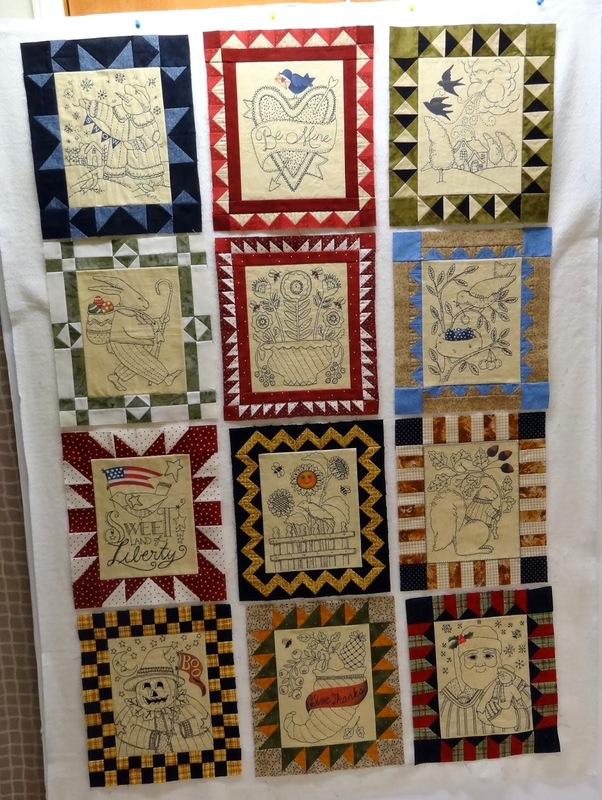 What a great quilt this is going to be! Each and every block is a treasure. Looking forward to seeing how you finish it off, and I think you are right - something neutral and simple so the blocks get all of the attention they deserve! That is the cutest BOM.....I'm sorry now I didn't get on board with it. I looked into buying those patterns and they sure are pricey...but it appears they might be worth it. I can't wait to see the finish! Your snowman block is so cute. I like all the blocks. That was a lot of embroidery work to complete. I think I will head to Kathy Schmitz website and check these out. What a wonderful quilt this is going to be. You may just prod me to do some needlework blocks in the future. Stay warm. Happy New Year to you, Mr. Squash, and the girls. You did GREAT on the blocks. What a fun quilt it will be. Glad you caught your oops on November and got it fixed. I agree, simple border(s) will be perfect. I absolutely love these blocks. Wow, your blocks are so beautiful and your embroidery is stunning. You are such a talent Candace!! Can't wait to see what you decide to do for sashing, etc. Hugs!! Your piecing is incredible, Candace! Congrats on finishing all the blocks. It is going to be a beautiful cosy quilt. I love all the little borders around each block. And I agree with the other comments. A simple lattice will set the blocks off beautifully! Hope your Christmas was merry. You made another beautiful block, Candace. I love all of them and I'm sure this will be a gorgeous and fun quilt. I've never heard of freezing fog and how interesting that it accumulates. Stay warm! I love the blocks, they're going to be a great quilt. 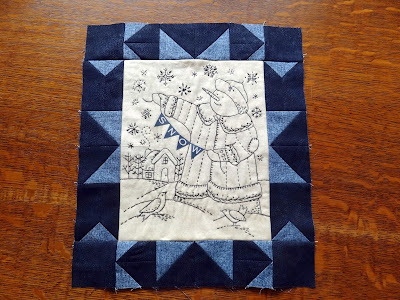 For the sashing, I wondered about using the same fabric as you have for the embroidery backgrounds and the same for a narrow inner border, then scrappy flying geese? I never can resist sticking my nose in, sorry! This will be a beautiful quilt with any sashing you decide to use. Really lovely. I really like that quilt. I see what you mean, now, about the November block. The corners weren't coming out right, were they? You're so brave and careful to change it. But when I saw it, first, in October, it was hard to tell anything was wrong. It's going to be a stunner. I love your blocks! Especially the new one! I might lean toward the nine patches, but I tend to go big or go home, which often leads to to overdoing things LOL! Maybe subtle nine patched with neutral sashing? No matter what you choose it will look amazing! WOW! Candace, they all look so great together. I just got my snowman traced on the fabric. Maybe you could use the same crackle fabric that we stitched on for your sashing. Congrats on keeping up with it each month. Happy New Year. I'm glad my suggestion worked. It looks fantastic, and I can quite understand wanting to get it finished rather than faffing about any more with it.